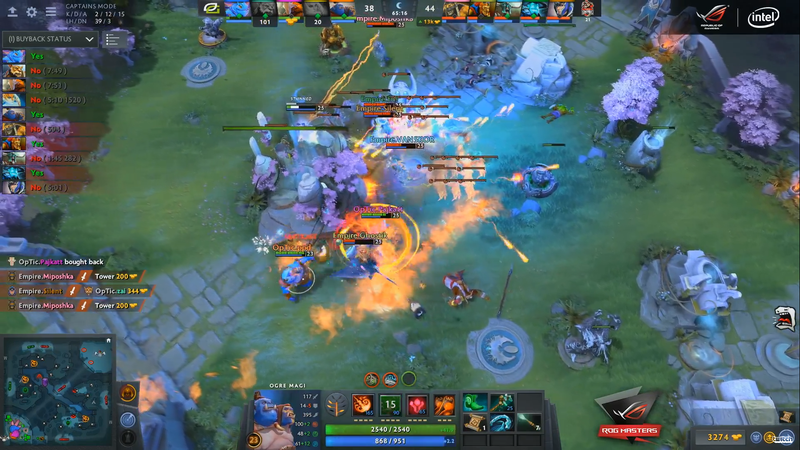 In the first game of last night’s ROG Masters grand finals, Team Empire was playing back from a huge deficit. Their barracks and towers were down, and their all-important ancient was wide open. How did they come back? By going straight for the enemy’s ancient. Barracks in Dota 2 are vital structures—destroying them boosts your own team’s mindless AI units called “creeps,” which spawn and charge down the lane towards the enemy’s base. Destroy all of a team’s barracks, and your team gets mega creeps, the ultimate form of these soldiers that are very hard to hold back. After taking down four members of OpTic Gaming, four members of Empire barreled down the middle lane while Rostislav “fn” Lozovoi pushed back the tide of mega creeps in another lane. OpTic’s dead members could spend some of their gold to buy their way back to life, but they hold it. At least, they hold it until they realize the middle barracks isn’t Empire’s target—it’s the ancient itself. While taking down barracks and towers help push your creeps deeper into the enemy base, those are all means to an end. The path to victory in Dota 2 is destroying the enemy ancient, the massive structure in the center of each team’s base. Empire knew this, and so instead of inflicting a few counter-scratches on their opponent, they went straight for the jugular. Turns out, it was the right play. Dropping two sets of Serpent Wards, giant cobra-shaped fixtures that spit fire like something out of GI Joe, the ancient’s towers fell fast. While the wards and creeps did their work, Batrider and Storm Spirit hold back the tide of respawning OpTic members. Luckily, the one member of OpTic who couldn’t jump in to fight was Martin “Saksa” Sazdov, whose Naga Siren song would have put a freeze to the push. Team Empire would go on to win the series 3-2, taking the ROG Masters 2017 title over OpTic Gaming.